Posh has banned them from promoting her fashion label. Instead she has hired curvy girls such as Daniella Sarahyba for the job. Apparently Posh wants to give out a positive image that you don’t have to be ultra skinny to look good. Hooray for Posh...now if she would only take her own advice. So as you know a few days ago we all read about how David Beckham helped a girl living with cancer have her dream come true of meeting him. He sent her the signed t-shirt and talked to her on the phone. He said she was an angel and now she is. She passed away Monday morning . I don't know all the details but I do know that Becks touched her life and made her last few days amazing I'm going to be keeping her and her family in my prayers. She was a strong girl and touched the lfie of many. HAMILTON–This story started with a phone call, so it's only appropriate it ends there. Except this time, instead of an international celebrity on the line, it was a McMaster student saying her class wanted to do something for Rebecca Johnstone. You may recall Rebecca as the soccer fanatic who came to this city's attention last week through a tale about a surprise phone call she received from soccer star David Beckham in the midst of a particularly bleak period in her fight against cancer. The brief conversation with her favourite player gave "Becca" a jolt of energy and a burst of life that'd been desperately needed after weeks of suffering through tough times. Sadly though, the story doesn't have a happy ending. Rebecca slipped away Monday night after a long battle with melanoma. She was 19. "His thoughts are with the family at this time," said Beckham's spokesperson, Simon Oliveira, adding the Real Madrid star had been made aware of her passing soon after it happened. Today, it's difficult to see past the devastating loss of a vibrant young woman with oodles of talent and a million-dollar smile. In time though, her family and friends may find comfort in the fact that her story touched this city in a rare way and led to an amazing outpouring of affection, sympathy and generosity. "It was something that was a lot larger than what anyone thought could happen," says her cousin, Bill Johnstone. Offers of help and attempts to keep her spirits up seemingly came from everywhere. The Fortinos at Dundurn Plaza immediately set up donation jars that were soon weighed down with $20 bills. A Tim Hortons where a friend of hers works began selling paper hearts for $1 each to help the family. By yesterday morning, they'd already raised $600. And many others in the city made donations to a trust fund set up in her name earmarked to help the family get to Kentucky for some aggressive cancer treatment that isn't available here. The ripples went much further than the city limits, though. The story was picked up by newspapers from coast to coast and discussed at length on talk radio. Major League Soccer called to see if there was something it could do. Toronto FC vowed to help. The Yale University soccer team sent an autographed T-shirt and pennant. "It meant a great deal to us to reach out to her," says assistant coach George Kostelis. 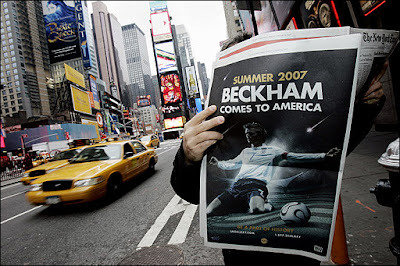 Then it left North American shores through Internet blogs and Beckham fan sites, and went worldwide. Immediately, people moved by her situation began reaching out to a girl they'd never met in a place many had never heard of. Calls and emails requesting information on how to make donations to the trust fund began pouring in from New Zealand, Scotland, the Netherlands and more. People even sent names of doctors and treatments they believed would cure her. "I think it's understandable that there would be a lot of interest," her cousin Bill says, citing the combination of an international celebrity and a young girl battling a horrible illness. "But the amount of interest was unbelievable." Which brings us back to that McMaster student on the phone eager to raise some money for the family and do whatever she could to help. When she was told Rebecca had died, there was silence at her end for a long time. Followed by a stumbling attempt to say something. Read this article and I challenge you not to cry....this makes me love Beckham even more now...if that was possible. Posh is changing outfits for every show. Here she is at the Jean Paul Gaultier show. Here is Posh as Paris Fashion Week with her OBF (Old Best Friend) Katie and Giorgio Armani. Isn't she so adorable smiling? and I am in LOVE with her dress....Love it or hate it ladies? Posh has put her foot down and when she says not she means no. She has said recently that she would rather spend her money on her new home, boys and shopping habits then donate it to a religion. A source close to the Beckhams said: “Tom spoke to David for hours about Scientology. He feels it could help to lift him out of the blues over his football career. Wooohooo Posh...I bet Tiny Tom is gutted, landing the Beckhams would have been a major addition to his cult. Posh and Katie went to dinner at the Ivy last night but that is not the werid part...what was werid is that Tom went to the restaurant with them (for the photo op) then left. Posh who looked ultra chic in a monochrome dress accessorised with her favourite Giambattista Valli belt. Katie looked....well just ordinary but then they were only going to dinner. After spending $100K on items for her boys’ new bedrooms that they don’t even have yet, Posh has been trying to decide on a suitable house. In the beginning of her search, Victoria was kinda digging Lionel Richie’s former multimillion home, (which was Billy Piper and Chris Evans) but turned it down for being too small. Geez....there is no pleasing this woman. The house looks plenty big to me. Posh must be pinching herself to be hanging out again with Jenni from the block...who knew they would have anything in common apart from Tom's attempts to get them to join the cult. They were at a party which was attended mostly by the Scientology set. Here is Posh looking A-mazing in Roberto Cavalli. The Cruises, apparently, have already arranged a summer party packed with A-list stars in the Beckhams' honour. Steven Spielberg and Jennifer Lopez are said to be on the guest list. Katie has helped Posh sort out everything from security to home help and even which charities to support. Apparently Posh will be a the Globes Monday night as Tom and Katie's plus one. Looks like she is not wasting anytime trying to fit into her new lifestyle...love it...thank god for the Beckhams. On Wednesday (apparently) she is meeting her new best friend, Jennifer Lopez because she is hoping to emulate her success as a celebrity fashion designer. But her main focus of the week is to find a family home and school for the boys. Here are some photos of her landing at LAX yesterday. She will be in LA for a week. All for just kicking a ball around. Posh will never leave Rodeo Drive and I would not blame her. 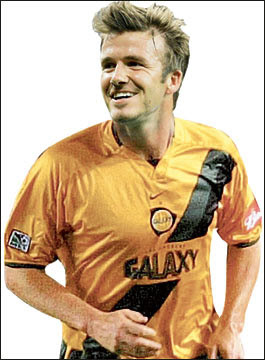 As "Brand Beckham" is packing for LA be prepared for the PR / media / advertising / merchandising onslaught. Here is an ad which was done a few years ago which features David, JLo and Beyonce. You may not be able to tell but David and the girls never met for the shoot. David shot his parts separately from the girls. They only met afterward at the ad launch (who has an ad launch? Brand Beckham does. 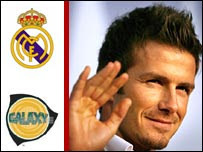 David Beckham will leave Real Madrid and join Major League Soccer side LA Galaxy at the end of the season. The 31-year-old former England captain will sign a five-year deal, reportedly worth £128m. 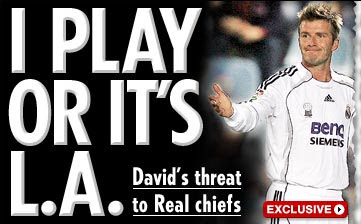 Beckham told Reuters: "This week Real asked me to make a decision regarding their offer to extend my contract. "After considering several options to stay in Madrid or join other major British and European teams, I have decided to join LA Galaxy." "I am proud to have played for two of the biggest clubs (Man Utd and Real Madrid) in football and I look forward to the new challenge of growing the world's most popular game in a country that is as passionate about its sport as my own. News just in David Beckham will be leaving his current Spanish football (soccer) team Real Madrid at the end of the season in May. The interesting question is where will he go....London, Italy or LA...???? "Real did initially offer the ex-Manchester United idol a new contract, but Beckham refused to commit himself to the club having fallen out of the first-team picture under coach Fabio Capello. The Primera titans now appear to have lost patience with the 31-year-old and Mijatovic insists he will no longer be granted the opportunity to extend his stay at the club. 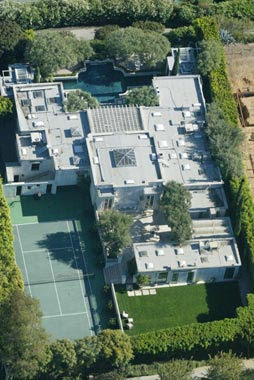 As you can imagine the UK Papers are full of the Becks move to LA since his apparent ultimatum. Real Madrid are now trying to back track on the comments made about David yesterday saying that an official statement will be made about his future...will keep you posted. David was recently in Japan - which apparently he was paid £6m for - to promote MOTORAZR for Motorola. Also a news report of Beckham in Japan (report in Spanish) where he kissing a woman who I will refer to as b!tch...yes I am jealous.